Our world has widened before us. Corporations expand their operations to all corners of the solar system in pursuit of minerals and resources. Most places are not suited for terraforming, but building colonies may greatly improve your income and your possibilities in achieving that higher goal – the terraforming of Mars. Send your trade fleet to distant moons! Colonize the clouds of Jupiter! And let your Earth assets propel you to success! Terraforming Mars: Colonies lets you visit the outer solar system. It features colony tiles where you can build colonies and send your trade fleet. It also includes new cards and corporations. This is an EXPANSION to Terraforming Mars. 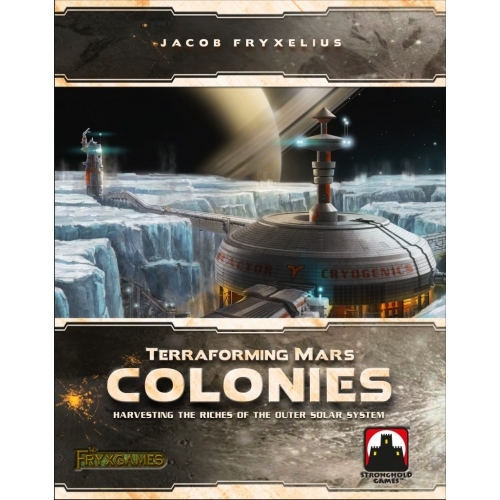 Terraforming Mars: Colonies is played together with the main game and may be combined with any other expansion and variant.